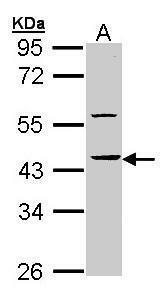 Western Blot analysis of HS1BP3 expression in transfected 293T cell line (H00064342-T01) by HS1BP3 MaxPab polyclonal antibody.Lane 1: HS1BP3 transfected lysate(43.12 KDa).Lane 2: Non-transfected lysate. Sample (30 ug of whole cell lysate). A: Molt-4 . 10% SDS PAGE. TA308194 diluted at 1:10000. 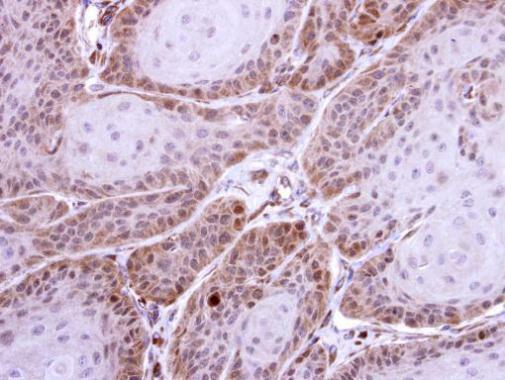 Immunohistochemical analysis of paraffin-embedded Cal27 xenograft, using HS1BP3(TA308194) antibody at 1:500 dilution.